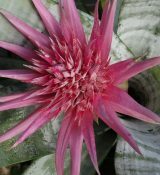 Wittrockia (wit-rock’ee-a) – Belonging to the Bromelioideae subfamily; growing in the southern coastal mountains of Brazil, nine species have so far been discovered and only two are seen in cultivation, Wittrockia smithii and Wittrockia superba. Epiphytic or terrestrial plants growing often in full sun or in medium intensity light about half-way up trees. Most species have thin leaves with few marginal spines; Wittrockia superba is the exception. The inflorescence is similar to that of the genus Neoregelia in most species. As can be seen, the diversity of size, shape and color of the Bromeliad family, together with its remarkable biology, makes its members unique, interesting and highly desirable. Once the flower has turned brown, do I cut it off and another will appear over time? what to do when flower turns brown? If you don’t like the look of the browning flower, you can simply cut it off.